Janet mbugua is one of most favorite TV presenters n Kenya.This year has been a pretty busy one for Janet. 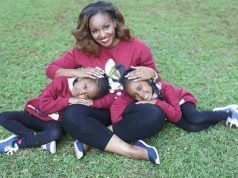 In her blog she writes about how she had to take a step back from all her projects to actually re-evaluate how things are going.Janet is the founder and brains behind Inua Dada whose sole aim to to empower the girl child. She had to make a presentation to a group of women at the Karen Country Club, but she realized, she wasn’t ready.Once she narrated how she almost quit her day job to be able to raise her baby boy, Huru.